politicians not taking holidays in Syria? Why is this happening in Europe on the 70th anniversary of the end of World War II? European Union offices, Dawson Street, Dublin 2. 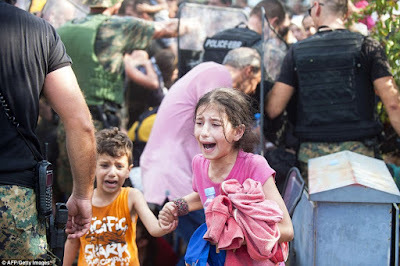 Over the past few days, I am sure, many of us have been distressed by images on television news and in every newspaper of the refugee crisis that is sweeping across the Mediterranean, the Balkans and through Europe. 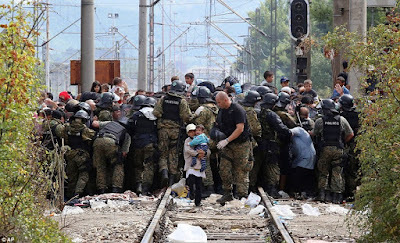 The images of frightened children clinging to each other or to bewildered parents, of vast numbers of people on railway tracks, of children and foot-weary people of all age or being held back as razor wire is rolled out, and of families clambering onto overcrowded trains heading north from the Balkans to Austria or Germany all bring back haunting images of World War II and the concentration camps. Have we failed to see the irony that this is all unfolding on the 70th anniversary of the end of World War II? Seventy years after World War II, governments are spending vast sums of money on border checkpoints, truncheons and shields, razorwire-rimmed detention camps, and now, as show on news channels across Europe last night, gas to hold back the people that are not being treated as, not being seen as human. In the day I am glimpsing flashing images of the concentration camps, and at night in my dreams I am asking over and over again what am I doing about this? Am I saying enough? Am I speaking out loud enough? Is anyone listening? Who is listening to these children? Who hears their cries and sees the tears and the fear on their faces? Who is saying ‘Stop!’? The responses from border police are not accidental, or taken in unguarded moments. The police we see rolling out the razorwire, raising their shields and truncheons and opening fire with teargas will hopefully have to answer for the actions sooner rather than later. As the United Nations High Commissioner for Refugees has pointed out in the last day or two, being an asylum seeker and being a refugee is not a crime. But treating them like this is criminal, is a crime in international law. The orders have come – just as they did over 70 years ago – the orders are coming from politicians. And they are finding their cheer leaders in the same red-top tabloids that backed Hitler and Moseley in the 1930s. When the Anglican priest and Guardian columnist Giles Fraser visited the migrant camps in Calais and worshipped with them in the makeshift chapel served by Eritrean priests, he was attacked by the red-top tabloids in England, with the Daily Mail and the Daily Express in particular criticising the BBC for filming Songs of Praise, the anodyne and innocuous Songs of Praise, in Calais, using public money, the licence fees, to tell the migrants’ stories. Despite panic about the “swarms” of migrants supposedly trying to reach British shores from Calais, only four per cent of Europe’s asylum seekers are applying to stay in the UK. And so far this Britain has taken no refugees from Syria – not one, none, zero. In telling contrast, a report in the Guardian showed that unemployed Britons in Europe are drawing much more in benefits and allowances in the wealthier EU member states than their nationals are claiming in Britain, despite British government arguments about migrants flocking in to secure better welfare payments. The language and distortion by senior EU politicians is heightening xenophobia throughout Europe. The British Prime Minister David Cameron has referred to a ‘swarm’ of refugees trying to enter Britain through Calais. The British Foreign Secretary, Philip Hammond, has portrayed these refugees as marauders who would soon hasten the collapse of European civilisation. The British Home Secretary, Theresa May, recently claimed that the vast majority of migrants to Europe are Africans travelling for economic reasons. The reality is that the overwhelming majority of migrants in the present crisis are refugees fleeing from wars and conflicts in Syria, Afghanistan, Iraq, Libya, Eritrea and beyond. Mrs May wants to send them home. If she thinks these countries are safe, happy holiday destinations, why does she not take her next Mediterranean package holiday in sunny Syria, luxurious Libya or ecstatic Eritrea? If European governments can force tour operators and holiday-makers to cancel packages in Tunisia because of one incident, one admittedly horrific incident, on a beach in Tunisia, why on earth do they think anyone would want to spend time in Syria, Libya, Eritrea, Iraq, Pakistan or Afghanistan right now? The answer from most European governments has been to focus on the traffickers, who are packing asylum seekers and refugees into coffin ships and sinking boats in the Mediterranean. But focussing on the traffickers avoids facing up to the causes of these conflicts. Who bombed and invaded Iraq, Libya and Afghanistan and turned them into basket cases? Who marginalised Syria as part of an “axis of evil” and so gave rise to the so-called Islamic State, which is financed, fuelled and facilitated by Saudi Arabia, the West’s strongest ally in the Middle East and the one country singularly responsible for the 9/11 bombings? The overwhelming majority of the people on the move today are refugees and not migrants. Middle Eastern countries and Turkey have taken the greatest burden, with Turkey hosting 1.8 million refugees from Syria alone, and Lebanon hosting 1.2 million Syrian refugees. In Syria, an estimated 11.6 million people have been displaced, 4 million of these externally. Refugees are fleeing Syria because between 150,000 and 330,000 of their fellow Syrians have died at the hands of the Assad regime, rebel groups and Islamic State, in a brutal civil war. Meanwhile, millions of people remain trapped inside Syria at the mercy of conflict, without food, water, or adequate shelter. Eight children are being killed each and every day in Syria, so that an entire generation is being traumatised by this horrific conflict. The mandate for the Irish naval presence in the Mediterranean must be renewed and that presence must be strengthened and financed fully. The EU must treat the Syria crisis as an absolute priority. The EU and the EU member states must offer an increased number of resettlement places to Syrian refugees, prioritising the most vulnerable. The EU and the member states must urgently increase funding for the response and to ensure that existing funding commitments are fully met. The EU and its member states must put immediate pressure on the international community to find a political solution to the crisis, prioritising the protection of civilians in Syria. You can do this by signing the urgent appeal that has been initiated by the agency GOAL. And we can, we must continue to put pressure on our local, national and European representatives and politicians. (Rev Canon Professor) Patrick Comerford is President of the Irish Campaign for Nuclear Disarmament (Irish CND). He was speaking at a protest about the present refugee crisis, organised by the Irish Anti-War Movement at the EU Offices in Dawson Street, Dublin, on 27 August 2015.
of Syria and the refugees in Europe? Child refugees on the border of Greece and FYR Macedonia last week ... who is going to speak up for the refugees in Europe? The Irish Anti-War Movement has organised protest about the present refugee crisis at the EU Offices in Dawson Street, Dublin, at 5 p.m. this afternoon [27 August 2015]. I have been invited to speak as President of the Irish Campaign for Nuclear Disarmament, and the other speakers include a refugee from Syria, a refugee advocate, Caoimhe Butterly of the Anti-Racist Network, TDs, local councillors and Memet Uludag of the Irish Anti-War Movement, who is speaking on an audio link from island of Kos in Greece. All these countries have been devastated by wars in which the West has played a central role. Iraq and Afghanistan were destabilised and impoverished by bombings and invasions in recent years, as a result of NATO bombing in 2011 Libya has descended into civil war and social breakdown, Syria was marginalised as part of a Bush-defined “axis of evil,” and the rise of the so-called Islamic State has been financed, fuelled and facilitated by Saudi Arabia, the West’s strongest ally in the Middle East and yet the one country singularly responsible for the 9/11 bombings. The money being spent on more police, barbed wire, walls, fences and gas would go a long way towards providing refugees sleeping on the streets of European capitals with basic facilities to wash, have clean food and get safe passage. Yet the French, British and Hungarian Prime Ministers have refused outright to accept an EU quota system for refugee settlement. The language and distortion by senior EU politicians is heightening xenophobia throughout Europe. The British Foreign Secretary, Philip Hammond, has portrayed these refugees as marauders who would soon hasten the collapse of European civilisation. The British Prime Minister David Cameron has referred to a ‘swarm’ of refugees trying to enter Britain through Calais. But the overwhelming majority of these people are refugees and not migrants. The actual numbers of refugees entering the EU is a tiny percentage of EU populations. So far this year 340,000 refugees have crossed Europe’s borders – only 0.045 percent of Europe’s total population of 740 million. Indeed, Middle Eastern countries and Turkey have taken the greatest burden, with Turkey hosting 1.8 million refugees from Syria alone, and Lebanon, a country of 4.5 million, hosting 1.2 million Syrian refugees. Meanwhile, millions of people remain trapped inside Syria at the mercy of conflict, without food, water, or adequate shelter. While the conflict continues the number of people in need grows; and the dangers associated with the delivery of aid remain acute. Eight children are being killed each and every day in Syria, so that an entire generation is being traumatised by this horrific conflict. The EU and its member states must offer an increased number of resettlement places to Syrian refugees, prioritising the most vulnerable. The EU and its member states must urgently increase funding for the response and to ensure that existing funding commitments are fully met. There are a number of ways you can say this. One is to sign the urgent appeal that has been initiated by the agency GOAL. Another is to put pressure on your local national and European representatives and politicians. And you can turn up at this evening’s demonstration at 5 p.m.